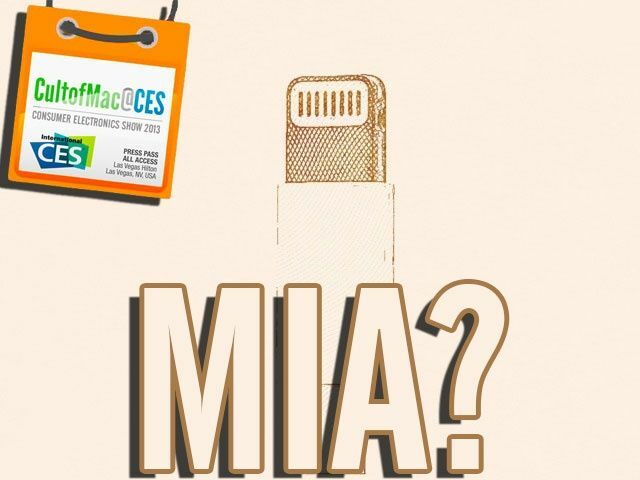 LAS VEGAS, CES 2013 – Here’s a question for you: it’s CES, the world’s largest electronics trade show. So where the hell are all the Lightning accessories? Oh, they’re here, don’t get me wrong. Sort of. At CES Unveiled last night, there were a few brave exhibitors who would mumble awkwardly into their collar when asked about Lightning accessories, or wave a non-functional prototype at us, or mumble something about April. But they’re mostly phantom prducts, and the representatives here talk about their coming Lightning line with the same nervousness as Orwellian citizens asked about a recent unperson. So it’s the world’s largest display of gadgetry, and you can’t get someone to show you a Lightning accessory that actually works. This despite the fact that the Lightning standard has been out for over four months, that Apple’s entire line-up of iOS devices have shifted over to it and consumers are absolutely chomping at the bit to get their hands on Lightning-ready gadgets. Yet so far, no one’s showing absolutely anything tangible. Isn’t that weird? To be fair, it’s the first press night of CES, and we’ve seen only a small sliver of the accessories to come. Tonight, we might be up to our bleeding eyeballs in Lightning accessories that will be shipping immediately. But right now, it doesn’t look like it. I talked to a couple of representatives last night with Lightning accessories they couldn’t quite show off, and what they said was that Apple was withholding Lightning from them until April. There will be Lightning accessories at the show, but they will be from privileged Apple partners, like Belkin; everyone else who wants MFi certification has to wait until April to start shipping. Who knows, they might just be covering their asses for not having their products ready, but it makes a degree of sense. We know that Apple met with accessory makers interested in Lightning MFi certification back in November, but we also know that the average Lightning cable is more sophisicated than the old 30-pin dock connector, and that Apple is trying to control the Lightning connector directly, making sure that only Apple-approved manufacturing facilities can make Lightning connectors. In other words, Apple’s exerting a lot more control over Lightning than they did over the old dock connector, and so far, it seems like they’ve only approved a few big players to release Lightning accessories. Smaller outfits are at a disadvantage, and will enter the Lightning fray with their first products months after the likes of accessory cartels like Belkin. We’ll see how the rest of CES shakes out, but right now, if the people we talked to are right, it looks like the majority of Lightning products are still three months away… just like they were back in October. Yeesh.